If you ask a Hungarian to tell you some of the typical Hungarian products and produces, you will very likely hear of the Hungarian paprika, the Rubik cube, Tokaj wine (especially Tokaji aszú) and a kind of herbal digestive bittersweet liqueur called Unicum amongst the top Hungaricums. And Unicum means Zwack Unicum from the Zwack family, exported to 40 countries all over the world. Now unlike the magic cube invented by Rubik, Unicum is a century old product, going back to the 18th century. What do the leading tenor Luciano Pavarotti, American icon Jacqueline Kennedy, and world famous conductor Zubin Mehta have in common? These celebrities have all shared a weakness for the Hungarian bitter liquor known as Unicum. What makes Zwack Unicum special? Like Jagermeister, Unicum has its own history. According to the Zwack family legend, the liqueur was made in about 1790 by a Zwack who was a doctor, and as he happened to be the Royal Physician of the Austro-Hungarian emperor Joseph II, he presented the unique concoction to the Habsburg kaiser. Joseph II appreciated the drink saying “Das ist ein Unikum!” (“This is a specialty!”), most probably with a bittersweet face as the liqueur is literally bitter and sweet at the same time. And more than that: you can feel the special harmony and magic witchcraft of forest sorceress’ age-old herbal knowledge. Unicum is a true trademark: a long standing (or flowing) and trustworthy brand in the Hungarian market, easily recognized by the white cross emergency sign on a deep green rounded bottle (it’s as default brand for Hungarians as Coca Cola for the international market, you just cannot imagine not having it). 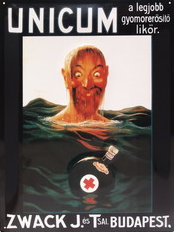 In 1915 Sándor Bortnyik has created one of the most famous and popular poster for Zwack Unicum: a shipwrecked guy happy to find a bottle of Zwack Unicum (message in a bottle) in the stormy sea (you can buy it as a poster too). The liquor even survived the communist period when the factory was confiscated from the Zwack family and the whole family had to escape. “My grandfather escaped with the recipe in his pocket and that was the only time when Zwack was not in the family.” says Izabella Zwack. In the 1956 revolution in Budapest, Unicum, the bottle of which looks like a peculiar vintage bomb, was used as a case for ammunitions against the Soviet tanks. And in 1988, just a year before the silent revolution and the birth of the new Hungarian democracy, the Zwack descendants went back to Hungary and bought back the Zwack factory and facilities.From 2007, Unicum is not only exported to about 40 countries, but the mysterious concoction is currently available in limited release in Ohio and New York too. As Frommer’s guide writes, “With its memorable bomb-shaped bottle, emergency-cross logo, and unforgettable taste — it’s Uniqum.” These days it is marketed in a more peaceful style (see the picture below made by Columbus Alive in Ohio). Besides Zwack unicum, which is a polarizing drink (either you love it, or you can’t stand it), often compared to Jagermeister, Ouzo, etc., the Zwack company also offers Zwack Attacks, Bloody Hun (basically the Bloody Mary a la Zwack with 3 oz. Bloody Mary mix, 1.5 oz. Zwack Unicum, celery, pepper, salt), and Zwackstache in foreign markets. In Hungary, you will find Zwack branded as Unicum, and a similar Zwack drink (less bitter, more citrusy) called Unicum Next. Give them a try. You will find Zwack Unicum in all stores and gift shops (a bottle of 0.7 l [1.43 UK pints, 1.48 US pints] is approx. 3500 HUF). 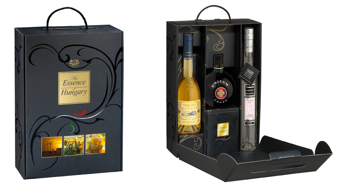 The Essence of Hungary is a beautiful gift package, which in fact combines all three flagship drinks of Hungary: besides Zwack Unicum, you will also get Tokaji aszú (a sweet Tokaj wine) and Pálinka (strong brandy made of flavoury fruits). For some reason, the Essence of Hungary drink trio is only available in the Zwack Specialty Store located about a 20 minute walk from the Central Market Hall: go from Liberty Bridge (Szabadsághíd) to Petofi bridge (Petőfi híd), then straight ahead to Dandár utca 1. in the 9th district. 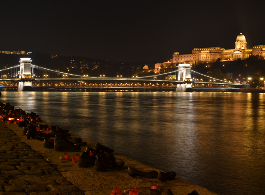 Or you can take the blue line metro and get off at Klinikák station followed by a 10 minute walk. 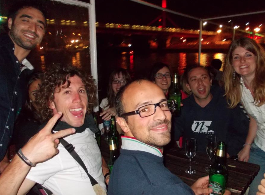 When you want to say cheers in Hungarian, you need to muscle up your linguistic skills a bit: you can say egg-ace-shage-ed-rae (Egészségedre, literally ‘To your health’), or egg-ace-shage (Egészség) for short (informal). For a less neutral version, you can say Isten-Isten (ish-ten, ish-ten or God-God). The real black belt version of Cheers is when you want to say cheers to everybody in a bigger company (‘to our health’), which is Egészségünkre, say egg-ace-shagen-krae. Cheerio will be also understood by most people.